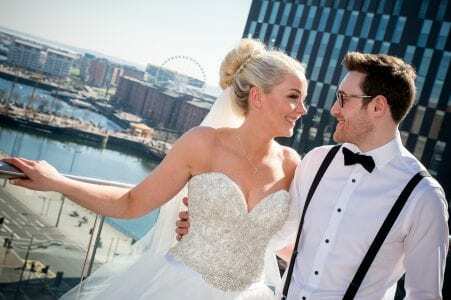 SARAH & ANTHONY // From the moment we met Sarah we knew that we would have such fun helping her find her wedding dress and that we certainly did! Sarah came into the boutique last year, full of excitement and oozing personality, we instantly hit it off. Sarah chose an Allure Bridals gown that absolutely represented her personality, showed off her amazing figure (despite just having had a beautiful baby) and had sparkle & glamour. 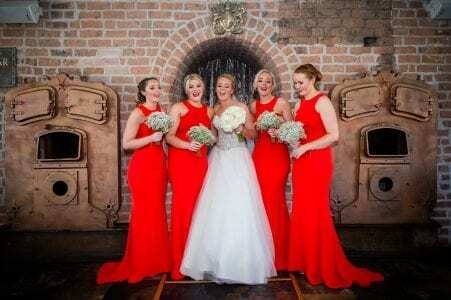 Her bridesmaids wore ravishing red Nadine Merabi fishtail gowns that absolutely reflected the glamorous style of the Wedding day. Sarah and Anthony met 10 years ago and were engaged in 2014 on an ice rink in New York, representative of their first date at an ice rink. The New York theme ran through their wedding day, with their tables named as significant places in New York. The opulent 30 James Street was their dream venue especially having fallen in love with the White Star room. The happy couple had 100 of their closest friends and family attend their glamorous wedding day on 8th April 2017 and compliments the hotel on their customer service and attention to detail. 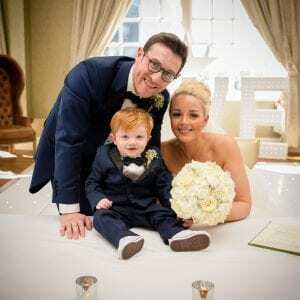 When we met Sarah and her family it was clear that she was a laid back, fun bride and it didn’t surprise us that when her table plans and name cards didn’t arrive the day before her big day, she took it her stride with friends stepping in to help. Sarah has said that her top tips for any bride would be, not to become stressed about the little details of your wedding and to thoroughly enjoy the process of picking your dress. Throughout Sarah’s journey we really got to know her family and bridesmaids, and can honestly say that she is truly an unforgettable bride for LBB. We loved that she had a clear vison of what she wanted to look like on her wedding day and that her gown reflected her as a person. I think you’d agree, she looked spectacular. Congratulations Mr and Mrs Campbell! Situated in the vibrant Rose Lane area of South Liverpool in Merseyside our stylish boutique is the perfect place to relax while we make sure you enjoy the experience of choosing your wedding gown.